Content: There are some complex names, a little violence, and hints of crushes, but I’d give it to anyone reading the Percy Jackson series. It will be in the Middle Grade (grades 3-5) section of the bookstore. When we saw Rick Riordan, and he was talking about his imprint, Rick Riordan Presents, one of my husband’s concerns is that the writers of these books on this imprint will just basically be telling Percy Jackson stories, superimposed on people of color and their mythologies. And, after finishing Aru Shah and the End of Time — with its Hindu mythology — I can say that’s partly true. 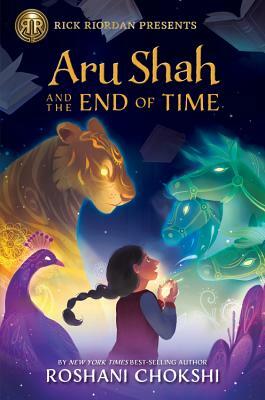 Aru Shah felt like a Percy Jackson book: a girl finds out she’s the daughter of a god (in this case, Indra, the god of Thunder), goes on a quest with a new-found friend and a sidekick to save the world (from the demon The Sleeper, which has awoken) , in a book full of humor, pop culture references, and non-stop action. So, yeah, in a sense that’s true. But Aru Shah is also wholly its own thing. Aru is more conflicted than Percy ever was: she, inadvertently sets off the crisis she has to save the world from, which fills her, not unexpectedly, with guilt. And while the quest part feels the same, there are notable differences: primarily being the mythology; there are a ton of stories in Hindu lore, and while I’m not familiar with all of them, I do know some, and I liked the spin that Chokshi put on them. I liked that Aru and her friend Mini’s relationship was complicated: they were reincarnated souls of former brothers, which makes them sisters, though they have different god fathers and different families in the human world. It gave a deeper, richer layer to their relationship, which I really enjoyed. Everyone in the book seemed more complex and mulit-faceted than I was expecting, which was nice. In short, while this does feel familiar, and will to anyone who has read the Percy Jackson books, Choski has also put her stamp on the stories, which is a refreshing, welcome thing. Thank you for the review. Another to add to Goodreads! I forgot to mention. I’ve started a shelf on Goodreads called Melissa Recommends.